Brach's Black Jelly beans also called jelly bird eggs. These jelly beans are perfect for those who just want black jelly beans. Chewy black licorice jelly beans. If you love black licorice then these are the perfect Jelly Bean. For those who like some black jelly beans , but don't want a whole bag pick up a bag of the classic jelly beans. You get an assortment of flavors including the black licorice beans. Many other companies have black jelly beans but the flavor can not compare to Brach's. They has a smooth strong black licorice flavor that makes you mouth beg for more. 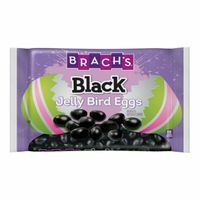 We have all of Brach's favorite jelly bird eggs. Classic jelly beans, speckled jelly beans and spiced jelly beans.